The lemon tree out the side of my house has been bursting with lemons for the last few weeks and I’ve been racking my brain to find ways to use them up. I’m really not the most sentimental of people but I quite like it that the variety of lemon my tree brings forth is a ‘Meyer’ lemon – my maiden name. According to my grandmother, one of our long lost relatives first propagated it and it’s now one of the most readily available varieties. 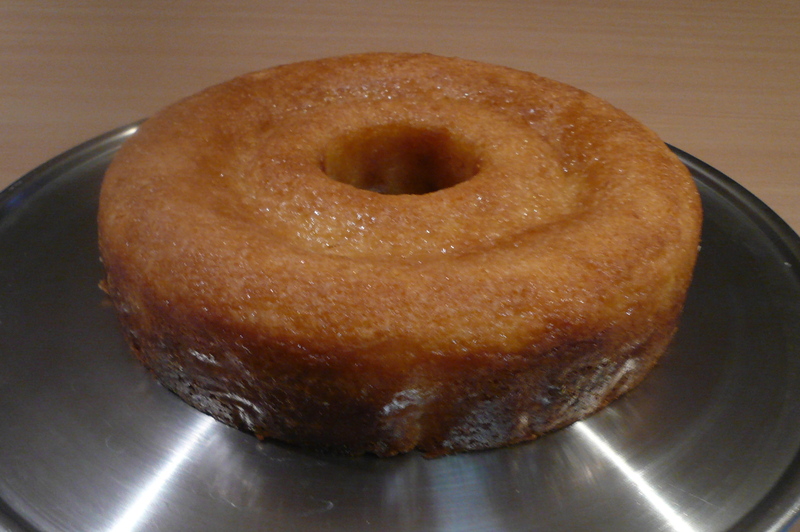 So I was excited when my friend Jodi emailed me her mother’s recipe for Lemon Tea Cake. When I made this ridiculously easy cake, I so enjoyed the neatness of it all – using all the lemon’s rind and juice with no wastage. This cake will set you back no more than 20 minutes and $3. Thanks for sharing, Jodi. Preheat oven to 180 degrees (170 fan forced). Grease and line a 20cm round, ring or loaf tin. Combine beaten eggs and milk and stir into mixture. Fold in lemon rind. Pour into the tin and bake for about 50mins, but start checking earlier with a skewer. Mix juice of lemon and 1/4 cup sugar and remove cake from the oven. Immediately spoon lemon juice/sugar mixture over cake and allow to soak into the cake. Leave in tin to cool. Serve by itself or with cream and ice cream for dessert. Oh, I’m so jealous you have a Meyer lemon tree! Apparently, they yield the best lemons ever & I’ve been unable to find a store which stocks Meyer lemons. I’ve always wanted to try a lemon curd tart if I hav ample supply of Meyer lemons. I didn’t realise they’re hard to buy in the shops, but they I’m sure they are quite common at nursery’s when looking to buy a tree. We scored the one we have in our yard from the previous owners.